CPO Robert McCarthy, from Worcester has been honoured at a prestigious ceremony on 24th January 2019. Robert received a British Citizen Award for Services to Volunteering (BCAv), at the Palace of Westminster. Rob has made a huge impact on Worcester, Malvern and Severn District Sea Cadets over 38 years. During almost 4 decades he has volunteered over 80 hours per month and worked tirelessly in coaching/mentoring and training young people from the ages of 10-18 in a variety of disciplines, including first aid, shooting, and water borne activities. This is despite Rob himself suffering with ill health as for the past 27 years he has had Crohn’s disease. Rob’s illness has never impacted on his duties as Officer in Charge of Worcester Sea Cadets Unit 378. Rob works with many young people from across the counties who have low self-esteem, anxiety, dyslexia and many other complex needs. Rob gives them encouragement and belief in themselves to pursue activities, they would have felt otherwise unable to achieve. Robert was presented his Medal by Experian’s Head of Community Involvement UK&I, Jan Barratt. Robert, is one of 30 medalists who were honoured at the prestigious ceremony on 24th January 2019, at the Palace of Westminster. All BCA recipients have selflessly undertaken various activities in support of a number of worthy causes. Each will receive a Medal of Honour, inscribed with the words ‘For the Good of the Country’. Medalists are also invited to use the initials BCA after their name. 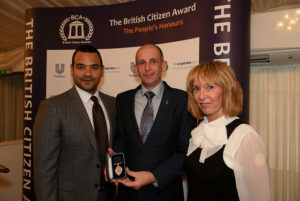 The event was hosted by TV star Michael Underwood, who stated “Having presented the very first British Citizen Awards, it’s a real honour to be invited back and a privilege. I was inspired learning more about the incredible people being recognised for their contribution to society”. The medals were presented by Senior Representatives from Specsavers, Unilever, Places for People, Unity Trust Bank, Experian and The Co-operative Bank, who all sponsor these awards widely referred to as ‘the People’s Honour’s.